A common question we hear is “how do you plan an outdoor wedding?”. If you are planning a wedding in a season that permits for an outdoor ceremony, it can be a wonderful idea. However, planning an outdoor wedding is always a risk because you can’t always accurately predict what the weather will do. In order to plan the perfect outdoor wedding, follow these guidelines. 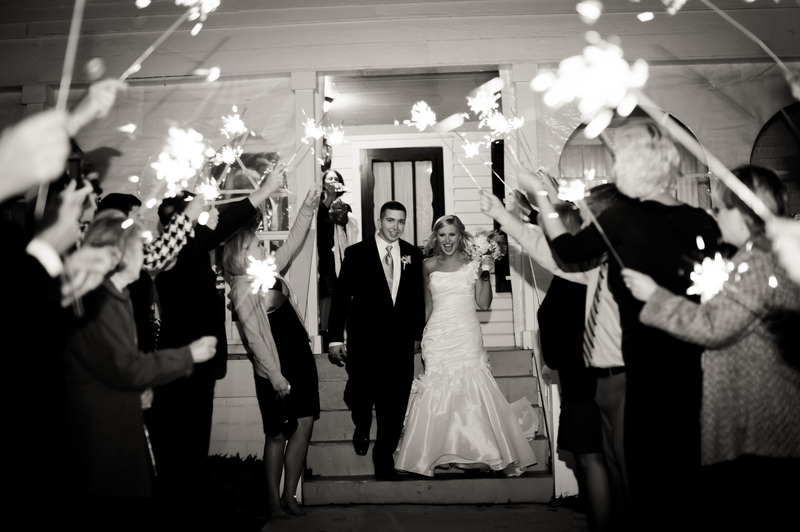 In order to guarantee a spectacular outdoor wedding, you MUST include wedding sparklers! Sparklers are a great way to utilize the outdoors and light up the night sky! Sparks will surely be flying as you run through an illuminated tunnel of your loved ones before departing for your romantic honeymoon getaway. Sparklers for sale can be found on our website in different sizes and can be customized with tags! If you’re planning a wedding during the summer months, be sure to keep your guests cool. Whether you rent generators or have fans and cool drinks, it is important to keep your guests comfort in mind. You want them to enjoy your special day! More importantly, plan for unexpected weather. ALWAYS have a backup plan for rain. Have an alternative such as a cover or an indoor option in case the weather doesn't cooperate on your special day. Hosting an outdoor wedding leaves you with many creative options! Include DIY projects including beautiful flowers, handmade signs, etc. Set-up stations for your guests to enjoy outside! Whether it's a homemade photobooth, a sundae station, or a lemonade stand, the opportunities are endless! If your ceremony or reception takes place in the evening, use string lights to make your wedding romantic and intimate. You’re starting a new life with mother nature! Enjoy the fresh air and the sights/sounds of nature. You couldn’t ask for a better backdrop then exposed elements of nature! The sights and sounds of nature will make your wedding unique and one-of-a-kind! Visit Wedding Sparklers Outlet for the best wedding sparklers for your outdoor wedding! Light up the night with our beautiful sparklers made for any occasion! It will make your special day truly magical!